Fair. Yellow pages due to age **SHIPPED FROM UK** We believe you will be completely satisfied with our quick and reliable service. All orders are dispatched as swiftly as possible! Buy with confidence! Very Good. Adrift: Seventy-six Days Lost at Sea (Corgi books) by Callahan, Steven, 1987-05-22. 256 p. Corgi books . Illustrations. Good. Adrift: Seventy-six Days Lost at Sea (Corgi books) by Callahan, Steven, 1987-05-22. 256 p. Corgi books . Illustrations. Very Good. 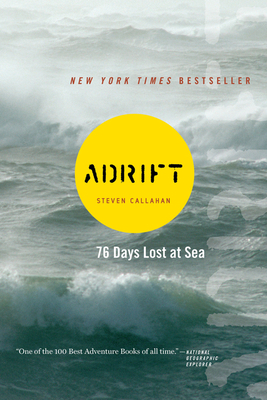 Adrift: Seventy-six Days Lost at Sea by Callahan, Steven, 1986-05-29. 256 p. 37ill. Good. Adrift: Seventy-six Days Lost at Sea by Callahan, Steven, 1986-05-29. 256 p. 37ill. This guy reminds me of the current Remas, and his attempt to circumnavigate the world on a j24 with no instruments no motor no sails except for a jib. Today he is in the middle of the pacific ocean almost out of food and water. 76 day's has a captain better equipped than /remas is but just as inept.. Its a wonder either survived. It's hard to imagine anyone not enjoying this adventure/character study of a man set adrift in his little rubber life raft after the sinking of his boat out in the middle of the nowhere. It's one of those page turner type books where you can't wait to hear what happens next. If you need to get a good nights rest, don't start this book late in the evening! The book offers much more than a survival story. It takes you into the inner reaches of the human mind and emotions. It helps one to appriciate the relative calm of our circumstances by comparison. For example, I learned to really appriciate the value of rain/water after reading how precious it is when you are faced with not having it. Everyone I've lent this book to has enjoyed and benefited from it's reading. It has the power to change the way you look at the world both within and without. Why they haven't made it into a movie is beyond me. A must read! Highly recommended!